CareVest® acts as a "mortgage lender" by directly funding dollars to real estate owners, builders and developers in British Columbia. CareVest originates, underwrites, adjudicates and administers all of its own investment opportunities. 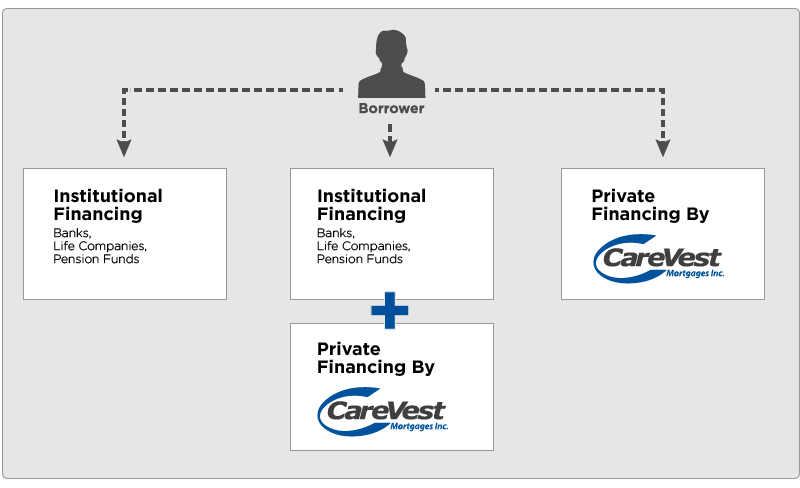 Financing Options with CareVest Mortgages Inc.
Our in-house lenders work with borrowers throughout the lending process. The origination phase includes the participation of our in-house lenders in local markets to better understand local market trends and changes in local market economics. This hands-on approach and knowledge of local market participants is a cornerstone in our evaluating lending opportunities brought to us for financing. Our initial assessment includes, but is not limited to, a thorough understanding of an opportunity’s “fit” in the market place, its sponsorship, and financial realities. The credit approval phase includes, but is not limited to, a detailed discussion and review of the data points included in the credit submission. The contracting phase involves the borrower and guarantor(s) acceptance of a commitment letter generated by the lender after credit submissions have been reviewed and approved by the lender’s credit committee. The funding and administration phase is administered by the lender and involves the review and satisfaction of all conditions precedent to funding and registration of security granted in the commitment letter.